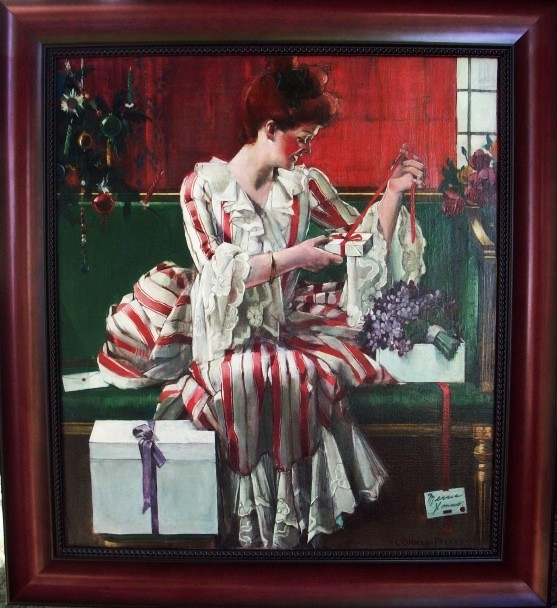 This painting of a beautiful young woman unwrapping a Christmas gift was created by Cushman Parker for the December 1906 issue of Good Housekeeping Magazine. This pretty young woman seems delighted to be opening her gifts, possibly from a special admirer. This painting is in unbelievable condition, and still shows the vivid color used by Parker, especially the green and red tones which were used to help enhance the Christmas setting. Note that the purple ribbon on the larger gift matches the purple flowers, also possibly a gift from her admirer. The detail and attention shown to the lace of this pretty young woman's dress is stunning, and gives us insight into the true talent of this great young artist. We say young, because Cushman Parker was born in 1881, which makes him about 25 years old at the time the image from this painting appeared on the cover of Good Housekeeping Magazine.